14 years ago, Christina moved into a small house, which was the perfect size for her and her mother. But after Christina married Joe and they had a baby, it was clear that that modest three bedroom, one bathroom bungalow wasn’t big enough for their family. They needed more space. Christina and Joe signed a $200,000 contract with a contractor to put an extensive second floor addition on the original house. At the beginning everything seemed fine, but slowly delays and additional expenses began to build. After a bitter battle over payments, the contractor put a lien on the house and walked off the job. Christina and Joe appealed to Holmes on Homes for help to finish their renovation. When Mike visited the house he saw at first glance how bad the renovation had gone. He knew he had to do something. 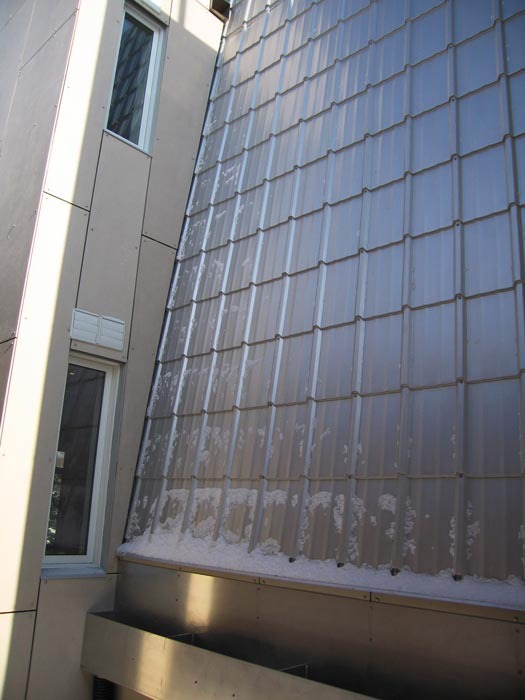 INSTACOAT™ is the perfect product for commercial roofs & emergency roof repairs. INSTACOAT™ seals out the weather with seamless edge-to-edge coverage that tops any commercial roof! A Green Roof system has been installed on the south facing roof deck. The green roof is made up of pre-planted modules that act not only to absorb rain run off, but also serve to provide several environmental and aesthetic benefits. One of the more notable environmental benefits is water conservation and reduction of storm water run off. The soil and plants act as a sponge that absorbs rainwater; this can greatly alleviate the impact on the municipal storm drainage systems. The system also acts to cool the house when the plants absorb and transpire water. 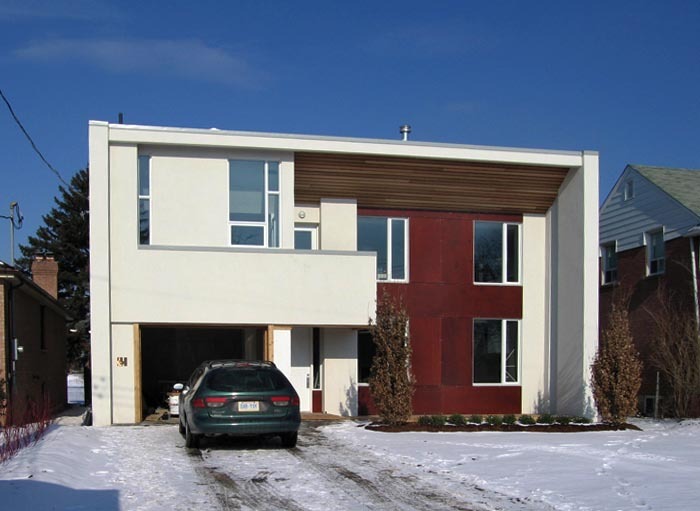 Coreslab Structures (ONT) Inc. was actively involved with Holmes on HomesTM rebuilding a family’s home in Toronto, ON. This project is what inspired The Holmes Group to create The Holmes Foundation. The house that was rebuilt was ruined by a contractor renovating the family’s home. The contractor left the house unfinished and unsafe and put a lien on the home for twice the value of the original agreement. The Holmes on Homes™ team decided to tear down and rebuild the entire house rather than attempt to repair all the construction that was unsafe and improperly done. 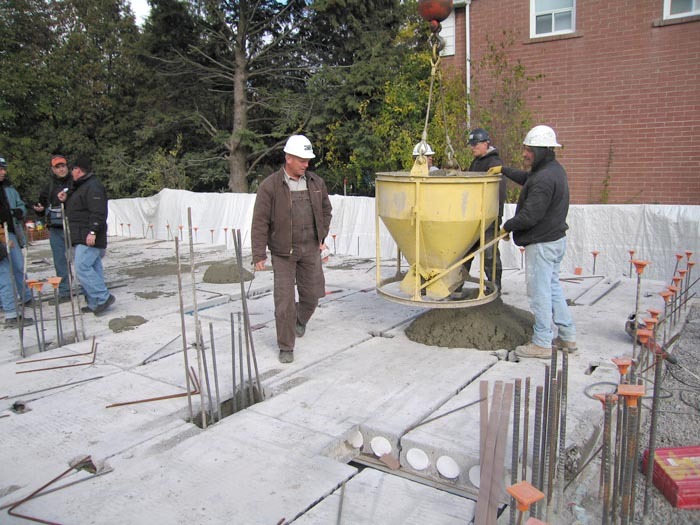 The new home was reconstructed using reinforced concrete walls carrying 3 levels of hollow core slabs (ground floor, second floor and roof), complete with solid slab landings and precast stairs. Hollow core slabs are precast, prestressed concrete factory made elements generally used for floors and roofs. Some of their advantages are long spans, design flexibility, fire resistance, sound control, durability, low maintenance and very fast construction. The 1220 mm (4 ft) wide slabs used here have six longitudinal cores running through them. The primary purpose of the cores is to decrease the weight, and material within the floor, yet maintain maximal strength. To further increase the strength, the slabs are prestressed with 12 mm (1/2 in) diameter steel strands, running longitudinally. 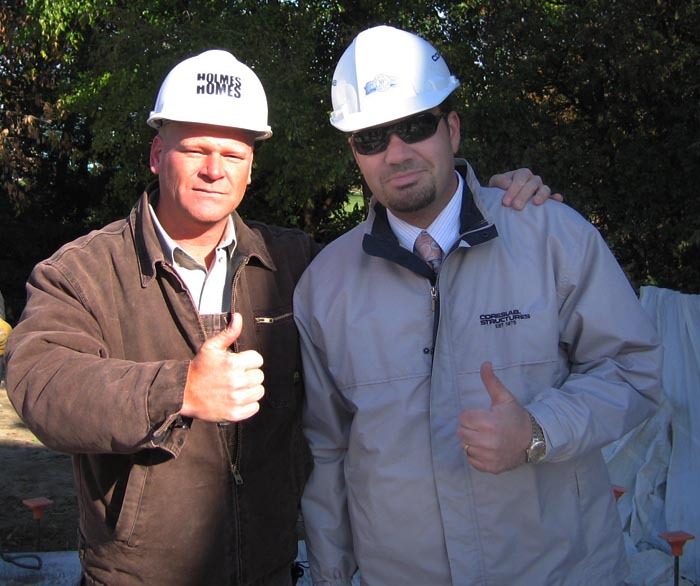 The goal of Mike Holmes and his team (including industry sponsors) was to create a house that is environmentally friendly, energy efficient, fire, water and mould resistant and designed to stand the test of time. 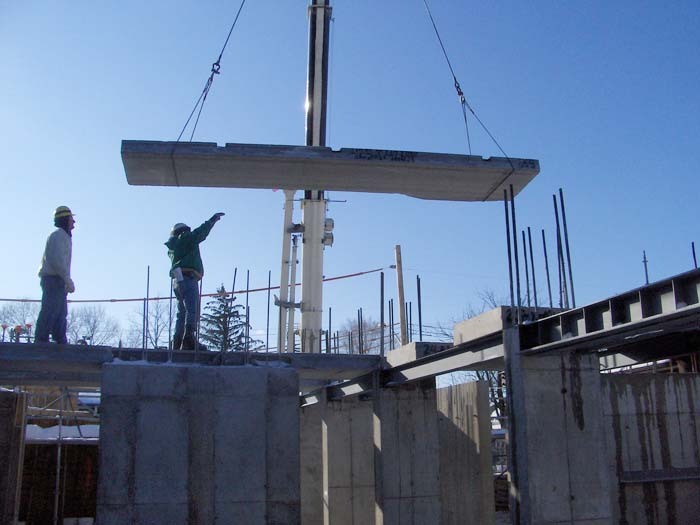 Precast concrete provided the ideal solution. The house is now complete. 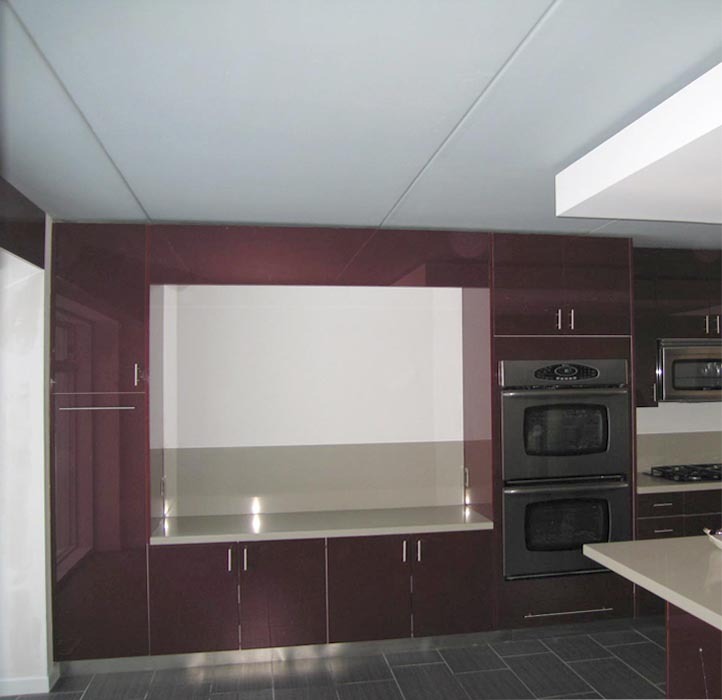 One of its unique features is the exposed building materials; the hollow core slabs were left exposed in the kitchen and bedrooms and simply painted. As you ride in the elevator you can see the cross-section of the hollow core slabs though the glass door. The family has moved into their new house with a sense of security knowing that it was built right and built to last.